My skin is dry and when I am wearing thick foundation for that high coverage look, it can be cakey and flaky at the end of the day. I discover that a facial oil can help me with this problem. 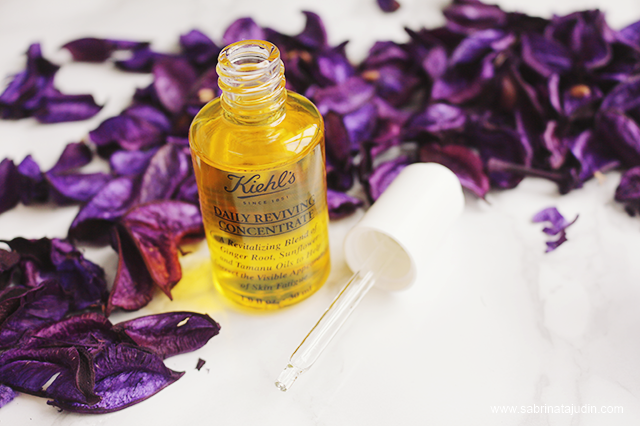 The most love facial oil from Kiehl's which is the Midnight Recovery Concentrate is a skin savior. So to keep skin hydrated and not dry I tried the 24 hours correcting concentrate regime. All of these are from Kiehl's! You know I am a fan of this skincare. One of my favorite is their Candelula Cleanser. I am eyeing on their face mask next. But here are the products I tried for a week now and I can see a difference! It is a simple day & night skincare regime that has help with my dry skin. During the day I will use this Daily Reviving Concentrate. I loveeeee the citrus scent it has! I think it is a citrus scent, I'm not sure but I love the scent of this facial oil and it makes me awake during my morning routine. This facial oil has a very watery texture and makes absorption fast. This helps to strengthen my skin against daily aggressors. It provides antioxidants protection which are the blends of Ginger Root, Sunflower and Tamanu. I use about 2-3 drops of this Daily Reviving Concentrate and pat it all over my face. Then in circular motions, I gently massage it on to my skin and do avoid the eye area. This retails for RM234 for a 30ml bottle. The star and my new "sleeping partner". 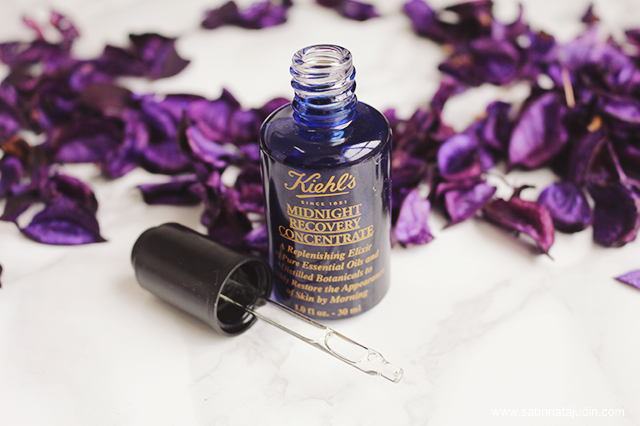 I use this Midnight Recovery Concentrate during the night. This facial oil helps to Regenerates, repairs, and replenishes skin for smoother, healthier skin. It has a very soothing and calm scent. Might be from the Lavendar Essential Oil in this facial oil! This also ask like a "sleeping mask". That is why it is best to use during the night. During sleep, this will helps to keep my skin hydrated even in air condition room, and when I woke up in the morning, my skin looks energize and less dull. This facial oil contains Evening Primrose Oil, Lavendar Essential Oil, Squalane. 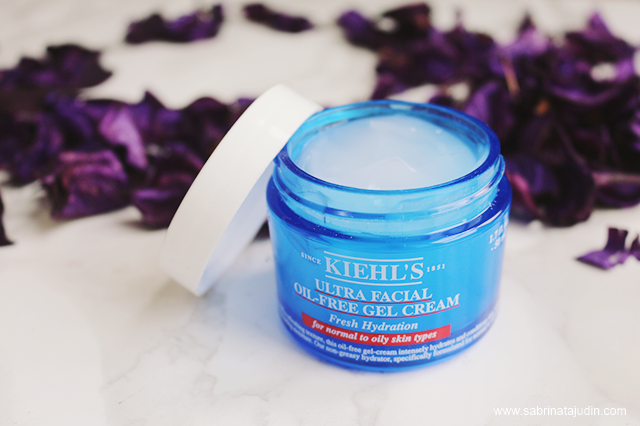 Squalane is a signature Kiehl’s ingredient which is the one that has been keeping my skin extra soft and supple. Same technique, I use 2-3 drops of this facial oil and gently press it to my entire face, then I massage it into my skin to let it fully absorb. This facial oil can be use alone or you can also pair it with your favorite mosturizer. My favorite product to pair with is the next item below! This retails for RM243 for a 30ml bottle. After either both of the facial oil, I will use this Ultra Facial Oil-Free Gel-Cream. This gel like cream contains Imperata Cylindrica which contains high concentrations of potassium, thus this has been providing my skin a long lasting hydration without feeling to oily on my face. It also contains Antarcticine, which is the one that help my skin a protection against dryness. Using the facial il can sometimes leave a oily texture to my face, but I pair up with this and it helps to make my face feels more comfortable and hydrated. It is true to what it said, my face does not look oily all day even when I am wearing high coverage makeup. The gel like texture leave a cooling effect to my skin. I skin feels calm and comfortable and ready for a sun block and makeup! It is a great base for makeup routine. This retails for RM120.00 for a 50ml jar. 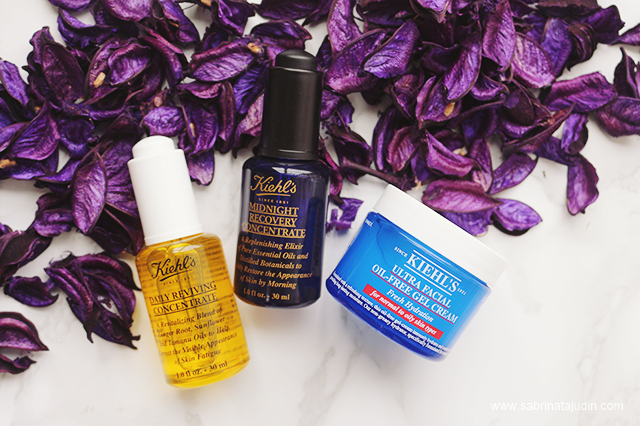 All Kiehl's products are Natural, Oil-free, paraben-free, fragrance-free, colorant-free. More info and shop online go to : https://www.kiehlstimes.com.my/ .